We have already looked at the large multinational Prospective Urban Rural Epidemiology (PURE) study. The objective of the study was investigate the dietary advice to which we have been subjected during the past half-century. The first paper concentrated on fats and carbohydrate. The conclusion was that dietary fat advice has been wrong: a higher proportion of the fat intake of the diet is associated with a lower rate of total deaths, cardiovascular disease (CVD) events, and CVD death. A higher proportion of carbohydrate intake is associated with worse health outcomes. Reducing total food intake might be necessary weight control, but reduction of the proportion on calories from fat, although encouraged officially, is not correct. The second PURE publication in The Lancet is devoted to the relationship between health outcomes and intakes of fruit, vegetables and legumes. 135,335 individuals from 18 countries were included in this analysis. The countries included 3 high-income (Canada, Sweden, and United Arab Emirates), 11 middle-income (Argentina, Brazil, Chile, China, Colombia, Iran, Malaysia, occupied Palestinian territory, Poland, South Africa, and Turkey) and 4 low-income countries (Bangladesh, India, Pakistan, and Zimbabwe). The investigation of fats and carbohydrate in the first paper looked at the relative proportions of each in the diet. Inevitably therefore, if the proportion of fat was reduced (on advice), then the proportion of carbohydrate must increase, and vice versa. The second paper is different in this respect. It looks at the consumption of fruit, vegetables and legumes in absolute measures, the actual amount consumed. 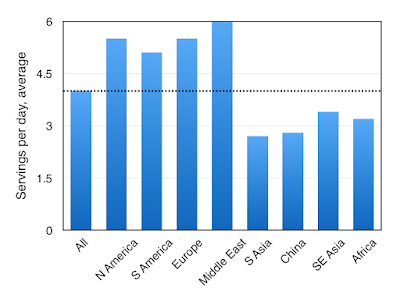 Because of the large number of participants in the study from many countries, it was not possible to measure the amounts in mass units (eg grams). 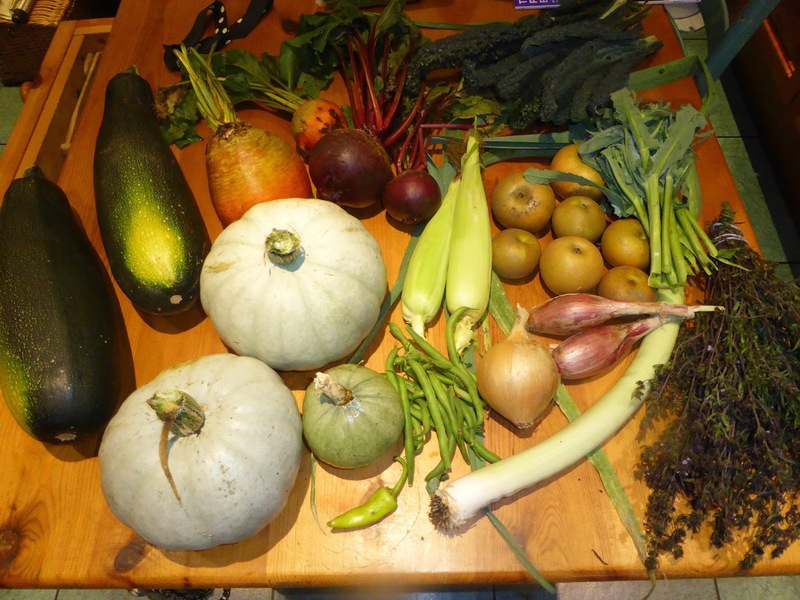 The measurement used was simply the number of portions per day, recognising that the size of a protion would vary from one person to another. During a median follow­-up of 7·4 years, there were 4784 major cardiovascular disease events. Greater fruit, vegetable, and legume intake was associated with a lower risk of major cardiovascular disease events. 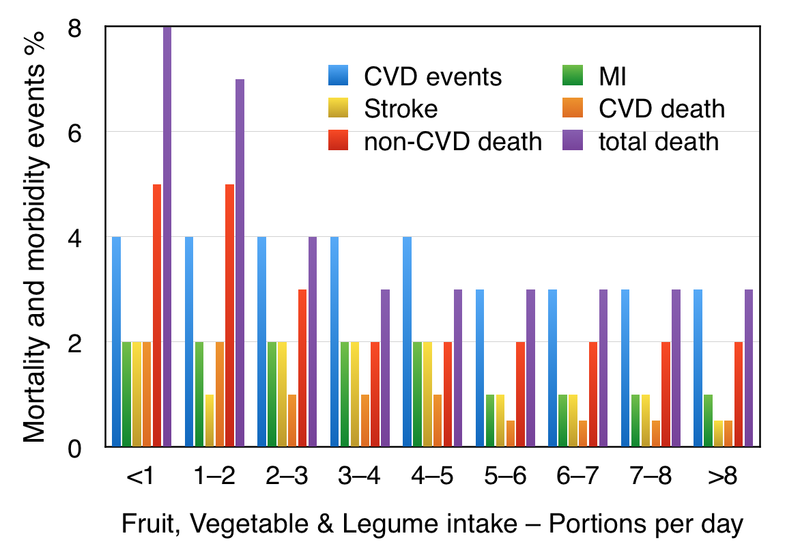 Overall, higher total fruit, vegetable, and legume intake was inversely associated with major cardiovascular disease, myocardial infarction, cardio­-vascular mortality, non-­cardiovascular mortality, and total mortality when adjusted for age. The overall results can be seen in Figure 1 above, a rainbow graph that can be broken down into its constituent parts. For example, in Figure 2 we see just total deaths. The group with the lowest intake of fruit, vegetables and legumes (<1 portions per day), we see a relatively high death rate from total deaths (all causes) of 8% during the study period, compared to 3% in those who consume more than 3 portions per day. If we look again at Figure 1, we see the pale blue bars which represent cardiovascular events. We can see that there are 4% cardiovascular events in the consuming up to 5 portions of fruit, vegetables and legumes per day, compared to 3% in those in the groups consuming more than 5 portions per day. 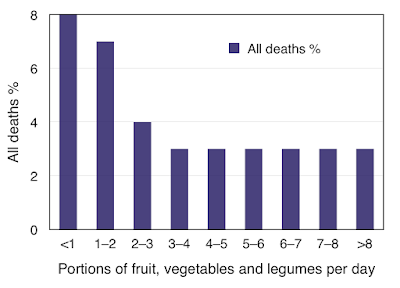 All morbidity and mortality events are higher in this with the lowest consumption of fruit, vegetables and legumes. It is interesting to look at the geographical variations of consumption of fruit, vegetables and legumes. The total amounts can be seen in Figure 3. The highest consumption is in the Middle East, and this is due to a particularly high consumption of fruit. It is also found that people who consumed more fruits, vegetables and legumes had higher education, higher levels of physical activity, lower rates of smoking, and higher energy, red meat and white meat intake, and were more likely to live in urban areas. In this study, 3·2 servings is equivalent to 400 g of fruit, vegetables and legumes per day. 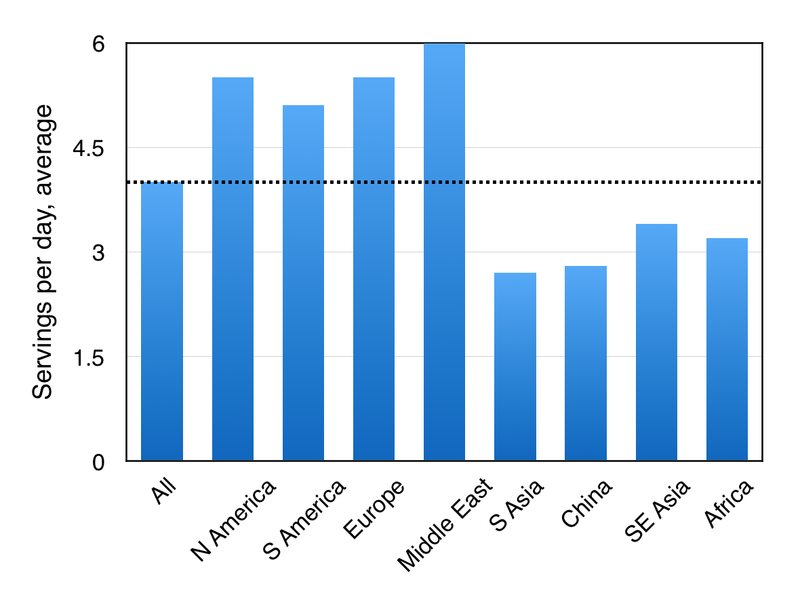 Many dietary guidelines in North America and Europe recommended intake ranging from 400 to 800 g/day, but for most individuals in poorer countries in other continents these targets are unaffordable . The study indicates that even three servings per day (375 g/day) show benefit against non­-cardiovascular and total mortality, and indicate that optimal health benefits can be achieved with a more modest level of consumption, an approach that is likely to be much more affordable. The PURE study is observational and it does not try to investigate the possible ways in which diet might influence human health. It is a public health investigation, to look for empirical ways in which diet can be recommended to improve health and survival. A high fruit, vegetable, and legume diet can be encouraged without understanding the mechanism of benefit. Several mechanisms have been proposed to explain the lower risk of cardiovascular disease with higher consumption of fruits, vegetables, and legumes. This would include cereals as a diet high in fibre has been related to lower CHD risk, but there is no conclusion as to mechanism.